The Trucker is a B2C and B2B brand intended for individuals and business leaders with broad-based interests in the professional trucking and transportation industry. The brand content and editorial scope of the publication includes breaking news related to industry regulatory changes and impacts, business and tonnage reports, industry perspectives, editorial insight and analysis, and special features. The content of each issue is also available at thetrucker.com. Jamestown Sun / Sun Country is a publication that is distributed locally in Jamestown, North Dakota that covers local news, including community events, entertainment, sports, business, real estate and classifieds. Duluth Budgeteer News is a publication that is distributed locally in Duluth, Minnesota that covers local news, including community events, entertainment, sports, business, real estate and classifieds. Native ad software publisher Sharethrough is calling on publishers to stop fake news from serving up in Google search and Facebook News streams. They are also asking advertisers to stop buying ad space on publisher sites that don't boycott the content. Fantastical news stories similar to the ones published in grocery store tabloids have begun to infiltrate the Web, but the biggest issue with the Web is that availability to the content spreads much wider and faster online compared with print. And for some strange reason, people reading this content online seem to take it as truth more often than not. "We are currently in an era where a new breed of bad actors are exploiting an oversaturated media environment by publishing blatantly false articles to make short-term profits by spreading sensationalized misinformation," stated Dan Greenberg, Founder and CEO at Sharethrough. "Sadly, fake and deliberately misleading news can spread like wildfire on Facebook, faster than real news, because of the nature of confirmation bias and the fantastical nature of the headlines. This trend is hugely detrimental to society." Greenberg, who serves as the co-chair of the IAB native ad committee and taught a class at Stanford on Facebook, also asked advertisers that actively fund fake news sites by buying ad space to reconsider their strategy. Facebook generated more engagement than the top stories from major news outlets such as The New York Times during the final three months of the U.S. presidential campaign, according to analysis from BuzzFeed News. The data shows that 20 top-performing false election stories from hoax sites and hyper-partisan blogs generated 8,711,000 shares, reactions and comments on Facebook. Compare this with 19 major news Websites that generated 7,367,000 shares, reactions and comments on Facebook. While publishers need to take responsibility for what they serve up on the Web, it's also important for readers to view the content with a critical eye and distinguish fact from fiction. It's ridiculous to believe that Facebook and Google can become the gatekeepers of truth, but as Facebook CEO Mark Zuckerberg puts it, the industry must build stronger technology that detects and measures misinformation. This means stronger algorithms to detect what people flag as false and misleading information. Zuckerberg also wrote that Facebook is exploring the labeling of stories that have been flagged as false by third parties in the social site's community, similar to the way Google flags malicious sites. Publishers & Platforms: What's Next? The never-ending controversy over cross-ownership of print and broadcast media properties continued this week with a new legal assault on government regulations blocking such combinations in major media markets. The News Media Alliance (NMA), previously the Newspaper Association of America, filed a lawsuit contesting the Federal Communications Commission's most recent affirmation of the cross-ownership ban. The new lawsuit, filed in the D.C. Circuit, seeks to force the FCC to reconsider its decision on July 12, decided by a party-line vote, to maintain the ban on newspaper publishers owning broadcast TV properties, particularly with reference to local broadcast news stations. Among other things, the NMA lawsuit against the FCC cites "substantial evidence showing that the Newspaper-Broadcast Cross-Ownership rule is antiquated and no longer serves the public interest." Many industry watchers have noted that following the proliferation of digital media, local newspapers and broadcast TV stations are just two news sources among many. They are coming under growing economic pressure from the transition to digital. In many cases, allowing cross-ownership of these properties in the same markets would enable substantial consolidation and cost savings for both publishers and broadcasters, and Congress mandated the FCC to review the rules against cross-ownership in 2010 and 2014. 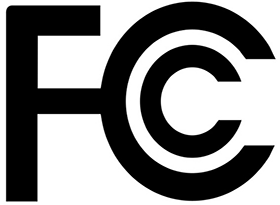 However, the FCC has continued to block cross-ownership on anti-trust grounds. Explaining the lawsuit, NMA president David Chavern stated, "Our industry provides long-term investigative journalism and local news and public affairs coverage that is intensely important to local communities. It makes no sense at all to prevent newspapers from helping to fund this essential activity by receiving capital and collaboration by an aligned industry such as broadcasting." The National Association of Broadcasters is filing a complementary lawsuit against the FCC as well. Congress is already cautioning the FCC, among other Federal agencies, against trying to implement any potentially contested rules or regulations in the final days of the Obama administration. House Majority Leader Kevin McCarthy sent a letter signed by House committee leaders urging the agencies to hold off on actions which may run counter to directives from the incoming Trump administration. 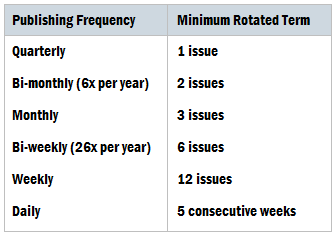 Rotated circulation is defined as individually addressed mail copies distributed to the same recipient for no less than three consecutive months. Special publications with irregular frequency may be an exception. Historical back-ups of rotated mailing lists for every issue must be maintained to establish qualification (i.e., the mailing list selected names were added to, the mailing list before the selected names were added and the mailing lists after the selected names were added). Documentation of the source of the mailing lists, including vendor or association name, date list obtained, and invoices and proof of payment for the purchased lists are required. Copies of original source lists should be saved as a reference. Mailing lists must include the source of the recipient name, the start and stop date of the subscription, and indication that the subscription is rotated. If codes are used in the mailing list to indicate the source of the recipient name, a full list of distribution and associated lists must be made available to the auditor. If you have questions about rotated circulation, please call Verified at 415-461-6006.